Benefit of Mayonnaise Hair Masks & Packs. Each one of us strives throughout our lifetimes to make our hair look lively, shiny and healthy. With the environmental conditions and lifestyles rapidly changing around us, hair is the worst affected. Pollution, toxic waste, smoke, unhealthy and greasy junk food, lack of exercise, stress and anxiety take a toll on the hair health making them weak, lifeless and dull. Hence, it is very important to take care of them by using natural ingredients that are full of minerals and nutrients that rejuvenate and revitalize the hair health. This peppermint and mayonnaise hair mask is great for conditioning and nourishing dry hair and scalp. It helps to moisturize the scalp, making the hair follicles and cells healthy and vigorous. 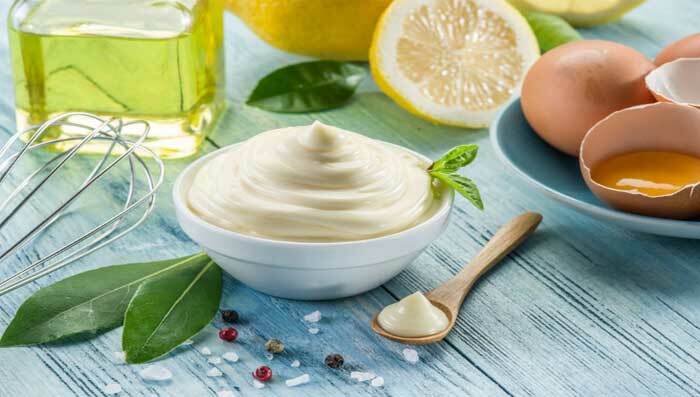 This mayonnaise hair pack with a generous amount of lemon and eggs is a great way to provide nourishment to the hair. It helps in keeping the frizz away and also treats the problem of dandruff. This mayonnaise hair pack with almond oil helps to treat split ends that cause the hair to be rough and coarse. It also nourishes the hair roots making them strong and shiny. Almond oil provides the required Vitamin E that helps hair grow long. Read more tips for healthy long hair at our blog. So, for those wondering how to use hair mayonnaise for lice, this is the answer. Apple cider vinegar helps in completely eradicating nits and lice and cleaning the scalp. For conditioning the hair, mayonnaise and apple cider help together to nourish and hydrate the follicles, making them long and strong.